Walter Lippmann is arguably the most influential journalist in American history. From the time of Woodrow Wilson to the time of Lyndon Johnson, what Walter Lippmann said mattered. His word was valued because of his exceptional capacity for analysis, and because he had the rare ability to make complex ideas and problems manageable and understandable. Lippmann combined the practical and the theoretical and saw them as inseparable. He savored the life of the mind and relished the arena of politics. He was political philosopher, social commentator, political advisor, and activist-intellectual. As the country grappled with an impressive influx of European ideas and with the threatening press of European problems, so did Lippmann. Like President Wilson, he came to believe that the condition of the modern world required that America either act or be acted upon. New methods of communication and propaganda meant that ideas contrary to America's would be widely heard. Reformed liberalism and the projection of that liberalism into a troubled world were the best hedge against totalitarian schemes and imperialist aggression. 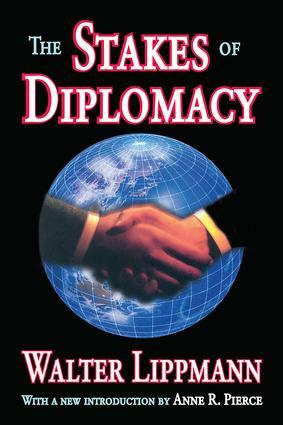 The Stakes of Diplomacy resulted from Lippmann's assignment by Wilson's Secretary of War Baker, to a project for studying possible terms of peace and ways to influence the world in a liberal-democratic direction. The Stakes of Diplomacy ends both with admiration for the peaceful nature of democracies and a plea for their further influence in the world, and with an understanding that democracy's influence will depend partly upon its physical might and geopolitical collaboration. Lippmann stands as a prominent figure in America's twentieth-century quest for power with honor. He concludes this volume with the warning that there is no safe way and no morally feasible way to turn back from our dangerous mission: "Unless the people who are humane and sympathetic, the people who wish to live and let live, are masters of the situation, the world faces an indefinite vista of conquest and terror."